Izalco's summit crater was visited to examine the fumarole field that was the site of many geochemical and mineralogical studies in the 1960's and 1970's. The remaining fumaroles consist only of water vapor with a maximum temperature of 86°C. Volcan de Izalco originated in 1770 A.D. on the S flank of Santa Ana volcano. Frequent Strombolian eruptions from the volcano, known as the "Lighthouse of Central America," produced a 650-m-high stratovolcano within 200 years. Information Contacts: Alain Bernard, BRUGEL, Université Libre de Bruxelles 160/02 50, Ave. Roosevelt, 1050 Brussels, Belgium. The Global Volcanism Program has no Weekly Reports available for Izalco. Remote infrared thermal patterns have been measured on the northeast flank . . . four times since December 1969. The sensor station is on Cerro Cerde at a distance of 1,100 m from Izalco. On 7 July 1973, a thermal anomaly appeared near the summit in a region that had been thermally inactive in earlie infrared studies. The anomaly stretched downslope about 50 m and covered an area about 1,000 m2. The highest of the anomalous apparent surface etemperatures was 15°C, 2° above ambient. Data just processed from the 24 November 1973 observations show the anomaly expanded to the east to cover about 5,000 m2. The most intense apparent surface temperatures occur in the same spot as the earlier pattern and register 19°C, 8° above ambient. The anomaly was intensified. The appearance and intensification of a thermal anomaly at Izalco indicates a change in the thermal regime of the volcano. The temperatures of the summit fumaroles were not unusually high in December 1973. The concentration of intermediate-depth earthquakes just south of Izalco was unusually high for the period 1971-72, as compared to 1967-70. Geophysical observations of these anomalous events are continuing. 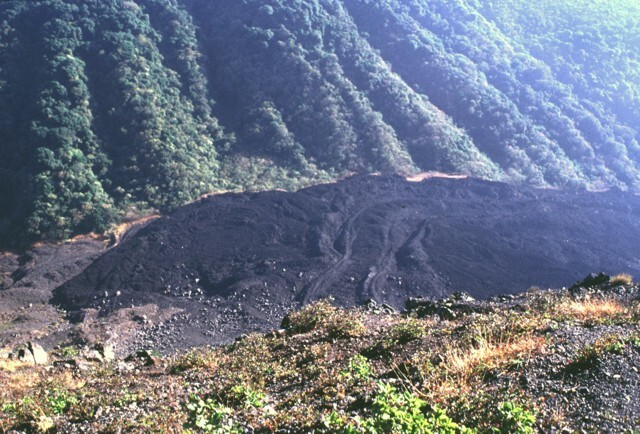 Izalco last erupted in October-November 1966, with a lava flow from its south flank. Prior to that it had undergone intermittent lava and pyroclastic eruptions from 1770 to 1956, building up a composite cone 650 m above its base. Information Contacts: Richard Birnie, Harvard University, Cambridge, MA; Ian Lange, Department of Geology, University of Montana, Missoula, MT; R. E. Stoiber, Department of Earth Sciences, Dartmouth College, Hanover, NH. During fieldwork on Santa Ana volcano in February, increased steaming was observed at the summit of Izalco relative to levels of previous years. Strong fumarolic activity occurred along the entire circumference of the 250-m-wide summit crater, with the exception of the NE side facing Cerro Verde. Activity was most vigorous at a vent on the N side of the crater floor, but was also strong along much of the inner rim of the crater and along its outer flanks. Steaming was observed over broad areas on the outer southern flanks to ~50 m below the rim, and on the W flank immediately N of a shoulder of the cone at ~1,800 m elevation, roughly 150 m below the summit. Activity had earlier been noticed to have increased in November 1998 following Hurricane Mitch. Most of the steaming was water vapor, and the increased activity was attributed to saturation of the still-warm cone by heavy rains accompanying the hurricane. Information Contacts: Carlos Pullinger, Calle Padres Aguilar 448, Colonia Escalon, San Salvador, El Salvador; Demetrio Escobar, Centro de Investigaciones Geotecnicas (CIG), Final Blvd. Venezuela y calle a La Chacra, Apdo. Postal 109, San Salvador, El Salvador; Lee Siebert and Paul Kimberly, Global Volcanism Program, Smithsonian Institution. 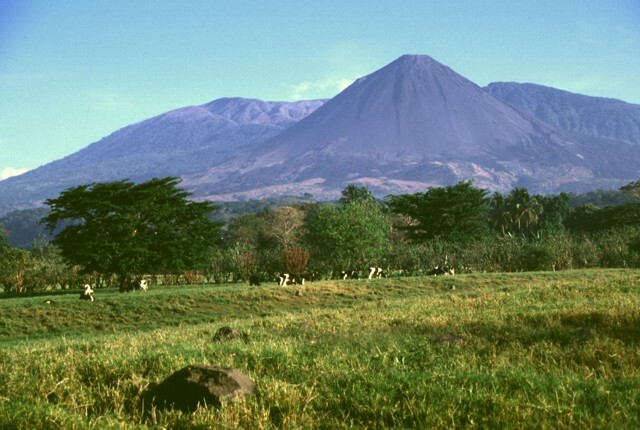 Volcán de Izalco, El Salvador's youngest volcano, was born in in 1770 CE on the southern flank of Santa Ana volcano. Frequent strombolian eruptions from Izalco provided a night-time beacon for ships, causing the volcano to be known as El Faro, the "Lighthouse of the Pacific." 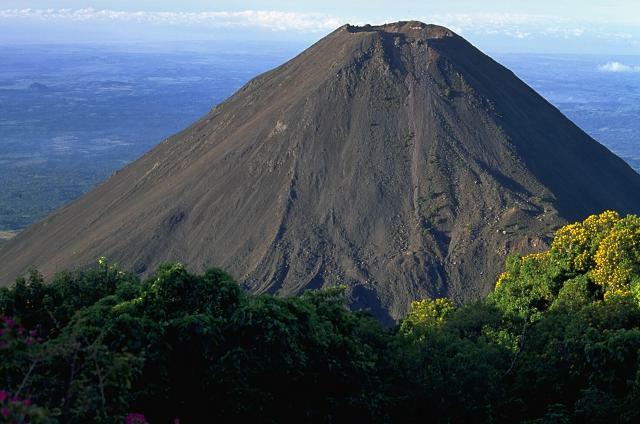 During the two centuries prior to the cessation of activity in 1966, Izalco built a steep-sided, 650-m-high stratovolcano truncated by a 250-m-wide summit crater. 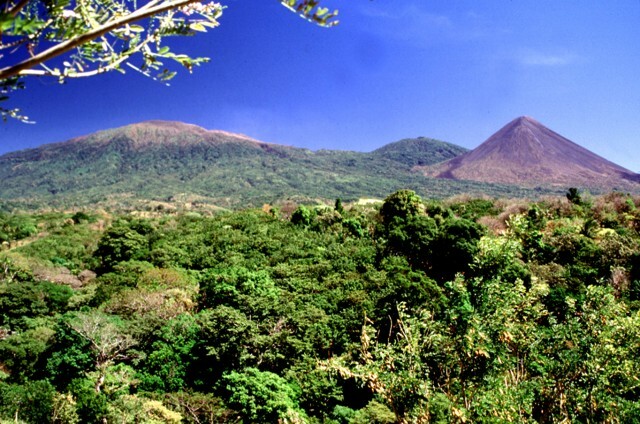 Izalco has been one of the most frequently active volcanoes in North America, and its sparsely vegetated slopes contrast dramatically with neighboring forested volcanoes. Izalco's dominantly basaltic-andesite pyroclasts and lava flows are geochemically distinct from those of both Santa Ana and its fissure-controlled flank vents. Lava flows were mostly erupted from flank vents and deflected southward by the slopes of Santa Ana, traveling as far as about 7 km from the summit of Izalco. 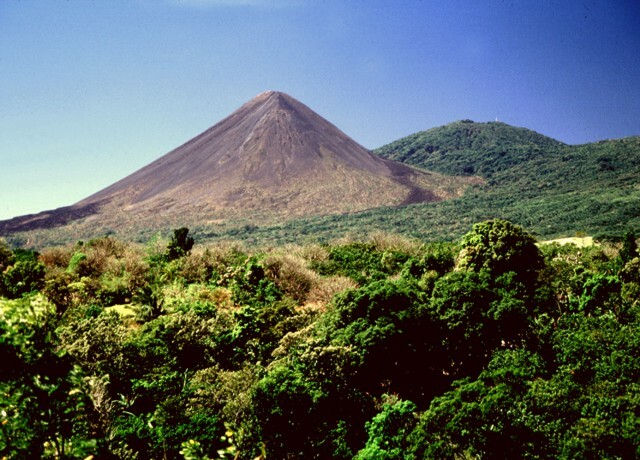 This volcano is located within the Apaneca-Ilamatepec, a UNESCO Biosphere Reserve property. Carr M J, Pontier N K, 1981. 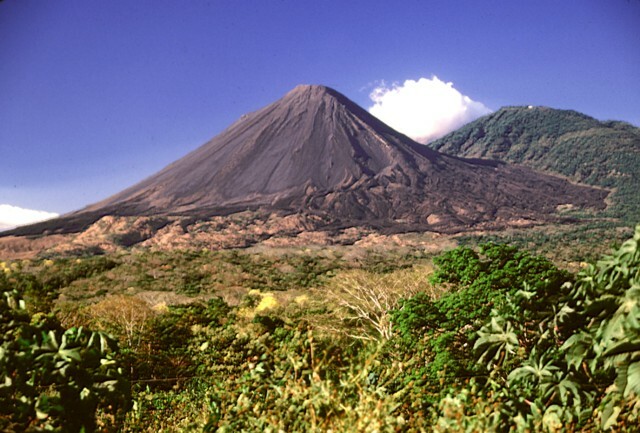 Evolution of a young parasitic cone towards a mature central vent; Izalco and Santa Ana volcanoes in El Salvador, Central America. J. Volcanol. Geotherm. Res., 11: 277-292. Halsor S P, Rose W I, 1988. Common characteristics of paired volcanoes in northern Central America. J. Geophys. Res, 93: 4467-4476. Pullinger C, 1998. Evolution of the Santa Ana volcanic complex, El Salvador. Unpublished Master's thesis, Michigan Tech Univ, 151 p.
Woodruff L G, Rose W I Jr, Rigot W, 1979. Contrasting fractionation patterns for sequential magmas from two calc-alkaline volcanoes in Central America. J. Volcanol. Geotherm. Res., 6: 217-240. There is data available for 54 Holocene eruptive periods. There is no Deformation History data available for Izalco. There is no Emissions History data available for Izalco. The unvegetated slopes of Volcán de Izalco, seen here from the north, are those of El Salvador's youngest volcano. It originated in 1770 CE on the southern flank of Santa Ana volcano. 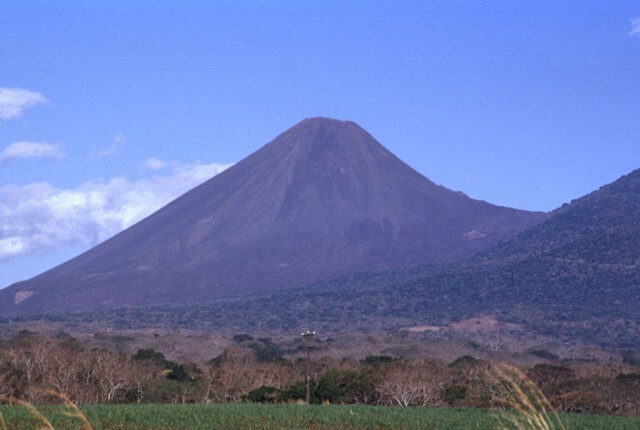 Frequent strombolian eruptions from the volcano known as the "Lighthouse of Central America" produced a steep-sided, 650-m-high stratovolcano over a 200-year period. 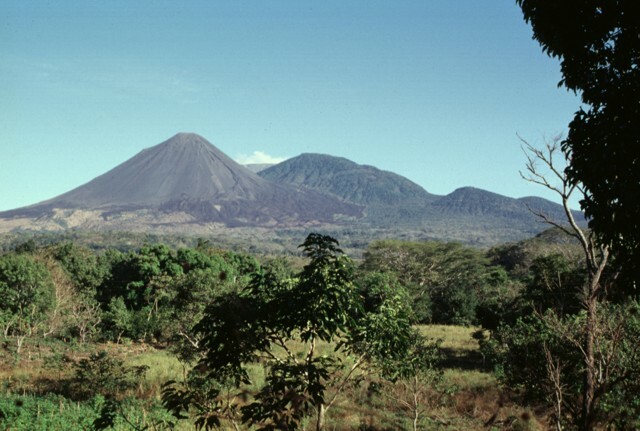 Izalco was one of the most frequently active volcanoes in Central America, erupting basaltic-andesite pyroclastics and lava flows from both summit and flank vents, until activity ceased in 1966. 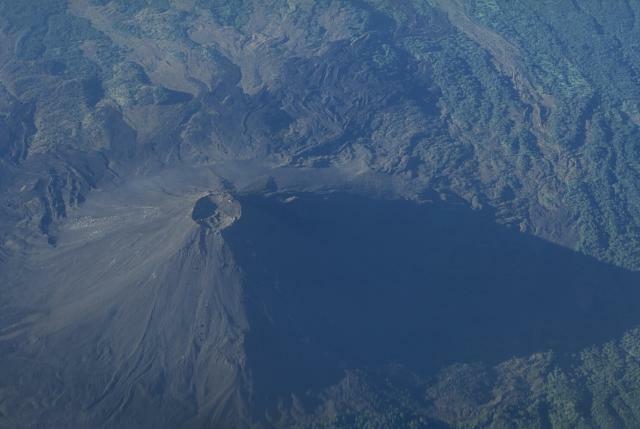 An aerial view looks down on Izalco volcano with south to the top of the photo. The 1950-m-high stratovolcano was constructed during frequent eruptions over a two-century period beginning in 1770. Strombolian eruptions from the summit crater were sometimes accompanied by lava flows that traveled down the slopes to the south, extending as far as 7 km from the summit. 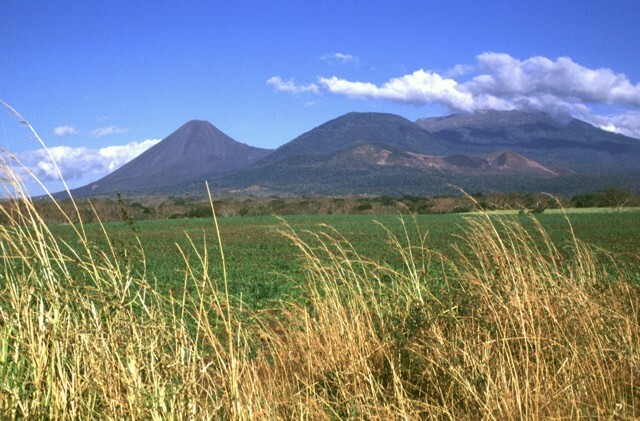 The flat-topped summit of massive Santa Ana volcano appears at the right, with conical Izalco volcano at the left in this NW-looking view from the Zapotitán basin. 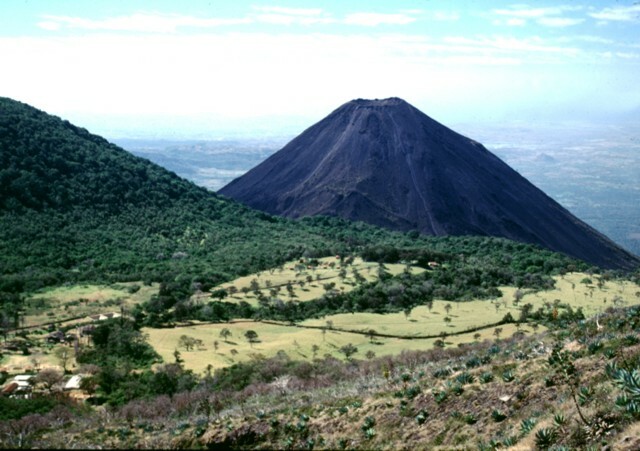 The pyroclastic cone on the center skyline is Cerro Verde, and the brownish scoria cone below it is Cerro Marcelino. Historical eruptions have occurred from the summit crater of Santa Ana and satellitic cones such as Cerro Marcelino on its SE flank. Izalco volcano was born in 1770, and the saddle between Izalco and Cerro Verde increased 100 m in height in the century after 1866. Conical Volcán Izalco is one of El Salvador's most well-known volcanoes. It rises more than 1000 m above its southern base (left) and 300 m above the saddle between it and Cerro Verde, a satellitic cone of Santa Ana volcano whose slopes are visible at the right. Since the birth of Izalco in 1770, the summit of the volcano grew about 650 m above its original vent on the flank of Santa Ana volcano. The saddle between Izalco and Cerro Verde increased 100 m in height in the century after 1866. Izalco volcano was once known as the "Lighthouse of the Pacific" for its persistent incandescent nighttime displays. It was constructed on the southern flank of Santa Ana volcano, whose flat-topped summit is visible to the left of Izalco. At the right is Cerro Verde, a basaltic-to-andesitic pyroclastic cone on the SE flank of Santa Ana. Frequent strombolian eruptions have left the flanks of Izalco unvegetated; dark-colored lava flows at its base issued from both summit and flank vents and extend up to 7 km from the volcano. A large unvegetated lava field on the SW flank of Izalco is seen here from its summit. Levees of individual lobes define distinct flows of the lava field, which extends up to about 7 km from the summit. Most of the flows seen here were emplaced prior to 1954. Wisps of steam rise from fumaroles near the summit, still active more than three decades after eruptive activity ceased in 1966. 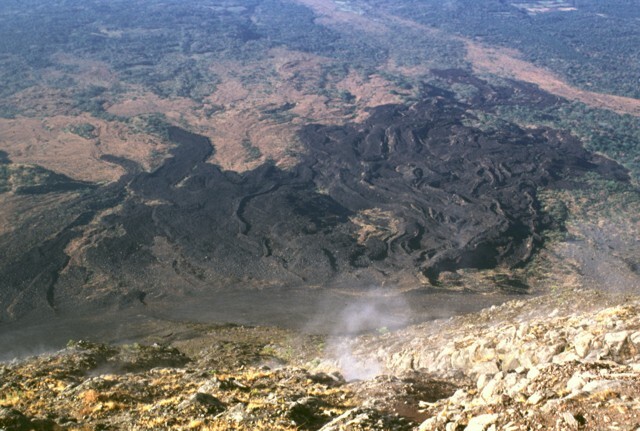 The dark-colored lava flows with prominent levees in the center of the photo were extruded from a vent on the NE flank of Izalco beginning in 1955. This lava extrusion took place during an almost continuous period of strombolian activity from November 1948 until the end of 1957. Periods of lava effusion took place July 1950, September-November 1952, October 1954, intermittently in 1955, November 1956, and January 1957. The eruption tapered off in late 1957 and was over by the end of the year. 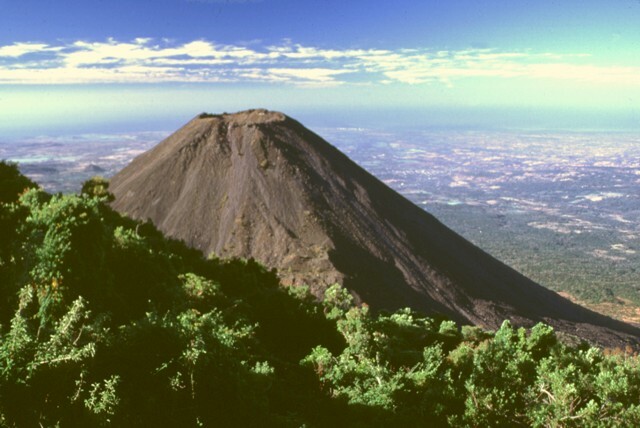 Izalco has been El Salvador's most active volcano during historical time. More than 50 eruptions, many of several years to about a decade duration, took place since 1770, when the volcano was born. During its 200 year history prior to 1966, when activity ceased, the volcano was rarely quiet for more than a few years. Eruptions took place both from the summit craters and from flank vents. Unvegetated lava flows are seen here on the SE flank below Cerro Verde volcano (center) and the twin cones of El Conejal and El Astillero (right). Santa Ana volcano rises beyond the summit crater of Izalco volcano, which formed beginning in 1770 on the northern flank of Santa Ana. 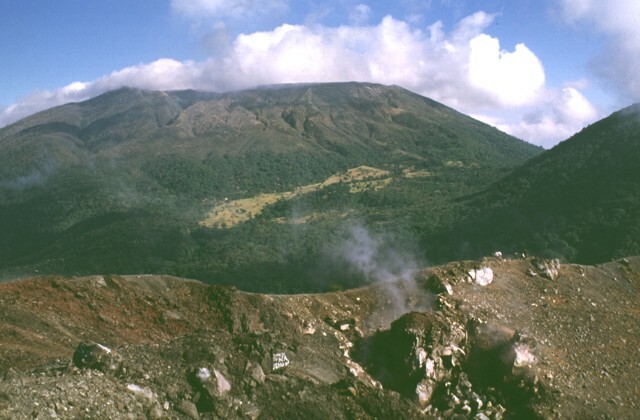 Fumarolic activity producing the faint steam plume in the right foreground continues at Izalco, but has diminished considerably since the cessation of its 200-year-long eruptive period in 1966. A complex of four nested craters gives the summit of Santa Ana a flat profile. The slopes of Cerro Verde, a satellitic cone of Santa Ana, are seen at the right. 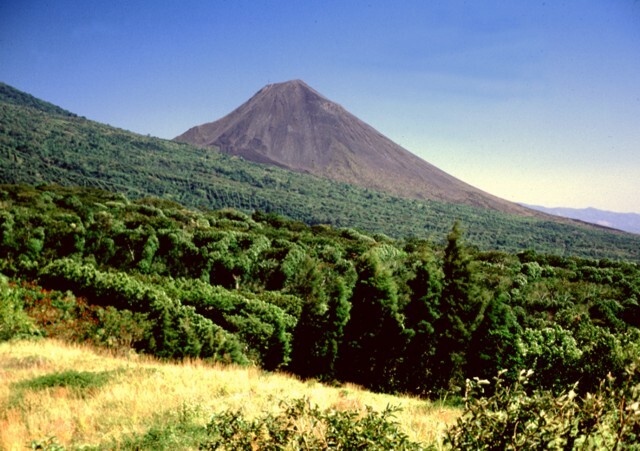 The unvegetated slopes of Izalco volcano contrast with the forests mantling Cerro Verde ("Green Hill") in the foreground. Izalco rises about 300 m above a saddle separating it from Cerro Verde. Exceptionally clear weather provides a view beyond Izalco to the Pacific Ocean, 40 km to the south; much of this area is underlain by deposits associated with a late-Pleistocene debris avalanche produced by collapse of Santa Ana volcano. Three peaks of the Santa Ana massif can be seen from the highway between Sonsonate and San Salvador. The summit of Santa Ana volcano, barren as a result of historical eruptions and recent gas emission, is at the left, and conical, unvegetated Izalco volcano is at the right. Forested Cerro Verde, one of a series of cones formed along a SE-NW line cutting across Santa Ana, is the rounded peak on the right-center horizon. A network of lava flows, mostly erupted from flank vents, circles the base of Izalco volcano. The flows were deflected by the slopes of Santa Ana volcano and extend as far as about 7 km from the summit of Izalco. Forested Cerro Verde cinder cone, one of many vents erupted along a fissure SE of Santa Ana volcano, forms the right horizon. An atmospheric cloud between the two cones obscures the summit of Santa Ana volcano. Izalco volcano grew to its present height of about 1950 m during a 200-year period following its birth in 1770 at an elevation of about 1300 m on the flank of Santa Ana volcano. Although Larde (1923) mentioned Izalco eruptions beginning in 1722, other sources consider the first Izalco eruption to have occurred in 1770. Intermittent strombolian eruptions and the effusion of dominantly basaltic-andesite lava flows built up the volcano to a height of 1825 m by the year 1866, 1885 m by 1892, 1900 m by 1951, 1935 m by 1953, and 1965 m by 1956. Sparsely vegetated Izalco volcano towers above the western flanks of Santa Ana volcano, mantled with coffee plantations. Izalco was born in a cornfield on the southern flanks of Santa Ana in 1770 and grew 650 m above the vent during the following two centuries. Izalco products range from andesitic to basaltic, and are dominantly basaltic andesite. Despite its proximity to Santa Ana, Izalco lavas are distinctly higher in alumina, calcium, and strontium. The most recent eruptions of Izalco are more similar to Santa Ana than earlier ones. Conical Izalco volcano rises beyond Cerro Verde pyroclastic cone, whose forested slopes appear on the left, as seen from the trail to the summit of Santa Ana volcano. Hotel de la Montaña was constructed at the summit of Cerro Verde to provide a spectacular panorama of the erupting Izalco volcano, which erupted frequently since it was formed beginning in 1770. As fate would have it, however, by the time the hotel was completed, the long-term eruption of Izalco had ended. 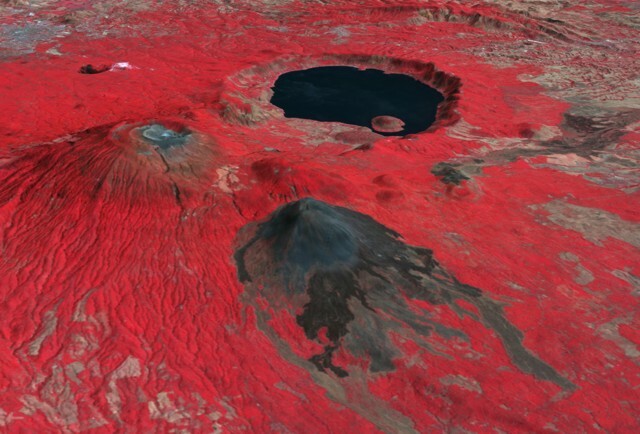 This false color NASA aerial oblique ASTER image shows Santa Ana volcano (middle left), Izalco volcano (center), and lake-filled Coatepeque caldera from the SW. The summit of Santa Ana is truncated by a series of nested craters, and a NW-SE-trending fissure cuts across the massif. Fresh lava flows drape Izalco volcano, active from 1770 to 1966, and descend its southern flanks. The grayish area at the far upper left is the city of Santa Ana, El Salvador's second largest city. NASA ASTER image, 2001 (http://earthobservatory.nasa.gov/Newsroom/New Images/). 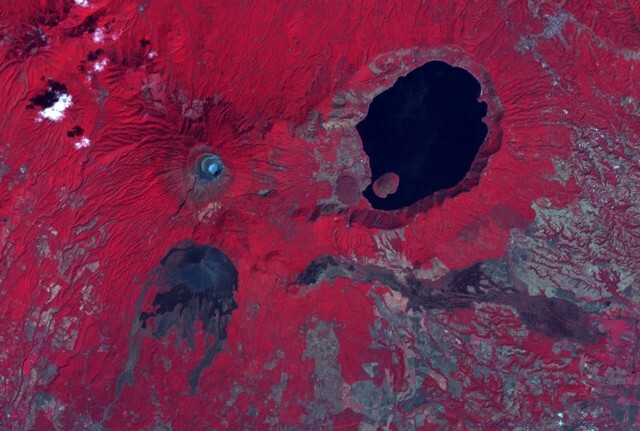 The summit crater complex of Santa Ana volcano with its small light-bluish crater lake is visible at the left-center in this false color NASA ASTER image (with north to the top). The dramatic lake-filled Coatepeque caldera cuts the eastern side of the Santa Ana massif, and Izalco volcano and its historical lava flows lie south of Santa Ana. A NW-SE-trending fissure cutting across the massif was the source of an eruption in 1722 CE from a cinder cone (center) on the SE flank that fed the lava flow seen extending across the image to the lower right. IRIS seismic stations/networks Incorporated Research Institutions for Seismology (IRIS) Data Services map showing the location of seismic stations from all available networks (permanent or temporary) within a radius of 0.18° (about 20 km at mid-latitudes) from the given location of Izalco. Users can customize a variety of filters and options in the left panel. Note that if there are no stations are known the map will default to show the entire world with a "No data matched request" error notice. Large Eruptions of Izalco Information about large Quaternary eruptions (VEI >= 4) is cataloged in the Large Magnitude Explosive Volcanic Eruptions (LaMEVE) database of the Volcano Global Risk Identification and Analysis Project (VOGRIPA).